My sister’s dog Ruby who is an 8 year old Chocolate Lab will jump into any body of water with such joy, grace, and abandonment while my dog Theo (pictured above) watches from the sidelines with awe at his cousin’s ability but also with frustration and extreme hesitation because as much as he wants to join her – he will NOT go in! When Theo was around 6 month’s old he was given a swim session with Randy Handwerger of S.S. Aqua Dog – hence the photo and life jacket above. She said that he did well and can swim nicely but I think given the choice he would never try it ever again. 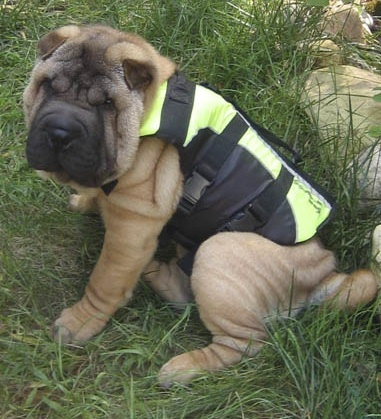 Sharpei literally hate water and Theo is true to form. Many dogs do not love swimming as inherently as Ruby so it’s probably a really good idea to “teach” them the basics especially if you have a pool, take them on a boat or bring them to the bay, beach or a lake. Randy, who i mentioned above, is among a fine group of people who have unfortunate things happen in their life and somehow turn it into something very good and positive. Years ago when I met Randy – she had a big, sweet dog Sylvester who was around 9 years old. Around that time, he developed Degenerative Myelopathy which is like Multiple Sclerosis in humans. She thought to include swimming laps in a pool in addition to his regular exercise to help build strength but she needed to be able to continue this program for him throughout the winter months. As the universe would have it and with help of friends – Randy built him a heated swim spa that she could use year round. She was able to swim Sylvester as well as help other dogs swim away their aches and pains, and “Viola” – S.S. Aqua Dog was born! Randy’s training includes teaching dogs of all ages how to swim and safely get out of the water, swimming dogs for exercise as well as for arthritic and hip dysplastic issues. In addition, she swims dogs recouping from surgery and ACL tears. Randy is a licensed Canine Therapeutic Massage and Reiki Practitioner. She knows first hand the value and benefits of swimming and because of it she believes that her dog’s life was extended way beyond his prognosis. ALSO – teaching a dog to swim and safely get out of the water can be the difference between life or death for a dog in the water. Unlike dogs – people are not born with the skills to instinctively know how to swim. John Ryan Sr. the Coordinator of Hamptons Life Guard Association together with his son John Jr. who is chief of the East Hampton Town Life Guards said that 40% of kids at the age of 9 to 10 can not tread water. Now that is a big deal out here where we have miles and miles of beaches and almost 5 out of every 10 homes have pools. In addition, think about all the private and public pools throughout this country that are jammed packed with kids for the most part from June through September, and add that to the warmer regions where kids have access to pools and beaches year round. Knowing how to swim is a big deal! There is a really interesting documentary in the works that is being shot in and around the town of East Hampton that is being produced by Mae Mougin of Southampton called “WATERPROOF”. It is almost 3 years in the making and is a feature length film that will tell the story of Mr. Ryan and his son John and their amazing effort not only to teach kids of all ages how to swim and water safety but also the intense training and grooming of our town’s life guards to be the “firemen of the sea”. This story shines a light on the hard work, dedication and training involved in saving lives out here with 12 life guard stands manned by 60 guards who make over 1200 rescues a summer. In addition – there are volunteers who go through rigorous training to become part of the Volunteer Ocean Rescue. They take the calls from 911 for beach goers or any other people in distress using the many unprotected beaches, bays and ocean. We really owe a tremendous amount of gratitude to the men and women everywhere who dedicate their lives to develop swimming programs for our kids and for their live-saving careers that help save our lives. Lynn Sherr – author of “Swim: Why We Love The Water” says: “Swimming is my salvation – it stretches by body beyond earthly limits, helps to soothe every ache and caress every muscle”. In an interview, she said that one of her swimming buddies claims that her regular sprints back and forth across the pool keeps her sane! In a NY Times article by Jane Brody – she writes that swimming can be enjoyed regardless of age and especially ideal for arthritis or knee and hip joint problems. Ms. Brody also states that it helps to preserve stamina, cardiac and respiratory function, muscle tone and flexibility as one ages. I know this to be a fact even though i am not a swimmer. My mother-in-law who is in her late 70’s and is an avid year-round swimmer looks amazing with good health, posture and poise of someone many years younger. I saw Mae recently after not seeing her for a few months over the winter, and asked her what she’s been doing because she looked great and had a glow about her. She told me because of working on the film with the Ryans that they convinced her to get back in… she is now swimming with the lifeguards and she looks amazing! Thank you for the informative article. I feel like going for a swim!